Ex-teammates Jay Buhner, Dan Wilson, Randy Johnson, Edgar Martinez, Ken Griffey Jr. The sellout crowd for Opening Day was treated to a specail reunion after ex-Mariners great Randy Johnson threw out the ceremonial first pitch. 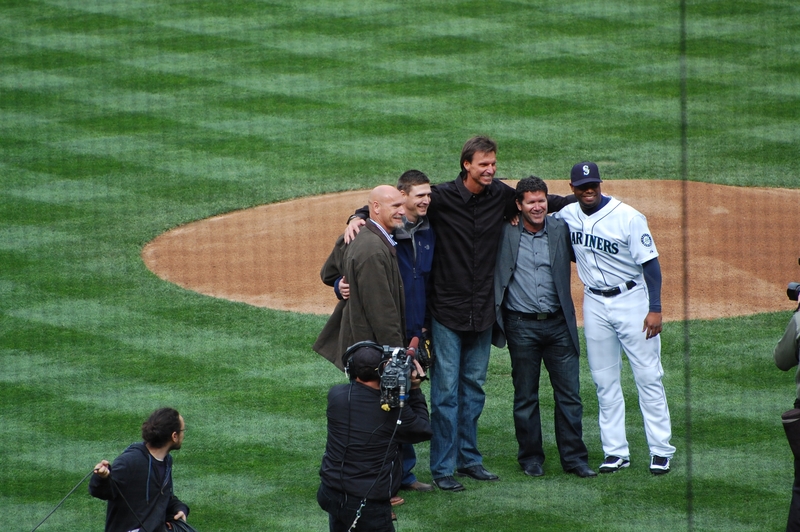 The future Hall of Fame pitcher was joined on the field by former teammates Dan Wilson, who caught the pitch (a strike), Jay Buhner, Edgar Martinez and Ken Griffey Jr. Imagine how many championships, perhaps even a World Series or two, the Mariners would have won if all five had remained teammates. Meanwhile, the pre-game player introductions went on without one Mariners pitcher. Right-hander Ian Snell returned to Florida this morning following the death of a relative. Manager Don Wakamatsu said Snell, the losing pitcher in Sunday’s loss to the Rangers in Arlington, had been dealing with personal issues the past few dayThs. The funeral is schedule for Wednesday and Snell is expected to return in plenty of time to make his next scheduled start, Saturday night against the Tigers. Wakamatsu also touched on other topics during his pre-game media session, explaining that he had a talk with left fielder Milton Bradley regarding the obscene gesture made in Arlington. The skipper said Bradley was “remorseful” and is putting too much pressure on himself. Bradley went 1-for-21 in his first week with Seattle. In other Opening Day news, outfielder Ryan Langerhans cleared waivers and was outrighted to Triple-A Tacoma. He will join the Rainiers on Wednesday. Great Opening Ceremony! So Very Special to see Randy, Edgar, Dan, Ken & Jay together again! Too bad they were not able to come away with a win. There has been so much made of having Ichiro and Figgins at the top of the order–what do you think of separating them to let Figgins settle in with the team and move him back later? More playing time for Sweeney and Matt T.? This is just a bump in the road….might need a bit of tweaking but have high hopes they will do well.